Planting in containers is great. Any container will do – terracotta pots, old recycled plastic buckets or even bags! If you don’t have a garden or you don’t have the space, you can still follow a self sufficient lifestyle and grow your own vegetables and fruit. 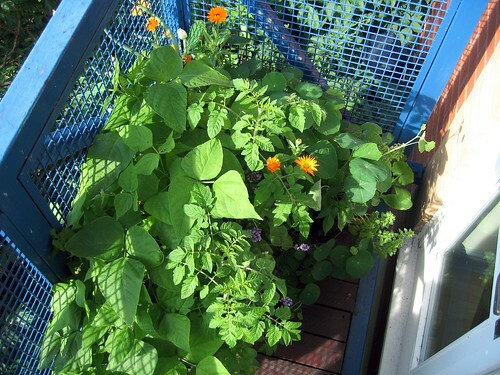 When you think about self sufficiency, you should think about containers and here is why! Container gardening may not be your traditional garden, but many people are turning to this way of having a garden, when you don’t have a garden. With the practice of container gardening, the possibility of having a self sufficient lifestyle is opened for many people. If you have ever considered growing things in pots, there are some things you should know. Just about anything can be grown in the right size pot. Many people that I know grow everything they need in pots on their deck or balcony. The larger size of the container will also allow you to grow more than one type of plant. Different plants in one container can make your container garden more decorative and more efficient. Growing bags can also be used, however, they are not nearly as decorative as pots. 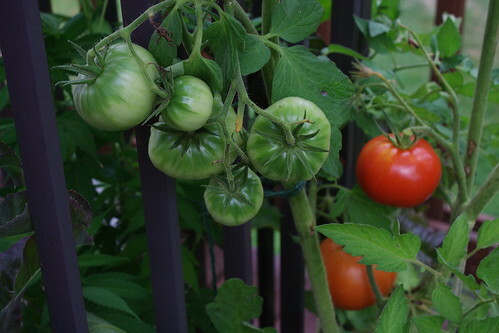 The plus side to these; they are and inexpensive way to grow vegetables. Tomatoes do very well in these bags. Hanging baskets are not the best idea for growing vegetables, mainly because they are too small. That being said some lettuce and herbs will do well in these. Position of your plants, your vegetables can be placed together in nice decorative containers, but they should not be grown in the shade.unless it is otherwise specified.Plants prefer to be warm and require sunlight; they do not do well if they get dried out. 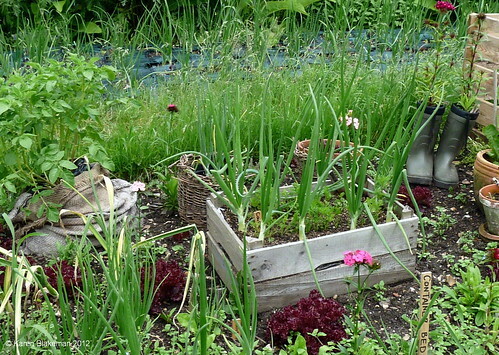 Container gardening requires more frequent watering. You just need some sort of container to put quality soil in and it needs to have holes in it for drainage. Most pots were originally terracotta, but now they are more likely to be plastic, but don’t limit your thinking – think decoratively, a weathered watering can, old boots. Container gardens are also flexible.They can be found on porches, front steps, urban locations, rooftops, your imagination is the only limit to your container garden. Before you get started take note of where you are going to have your container garden. Does your pot receive a minimum of 6 hours of sun? Your plants need sunlight to grow. Be sure to pick a good soil for your pots. Chose a compost soil as these tend to hold moisture and will help your plants immensely. 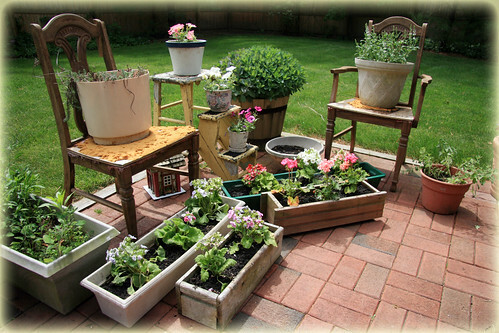 It is easy when growing plants in containers to let them dry out, be sure to water them frequently. The potting soil should be loose and allow drainage to give the right aeration for the plant. This will help to prevent root rot. You should be sure to fertilize the plants about every two weeks. The plants can be watered with diluted fish emulsion, seaweed extract, or compost tea. You can adjust the frequency of fertilization depending on how the plants respond. Of course pots add beauty to your space and you can eat what you grow – but planting in containers reduces the risk of soil borne disease in the plants, it virtually eliminates weed problems, and the mobility of the containers makes it easier to control moisture, sunlight and temperature. Planting in containers is fun and easy; it has gained popularity over the last few years. Many people are reaping the benefits of containers. the plants are more accessible to you, the gardener. the containers limit the amount of stooping and bending you have to do. you have the ability to isolate the plant or plants that may have become invaded by pests or disease. There are so many wonderful reasons to grow your plants in pots. And because you don’t need a garden to get gardening, just jump into it!